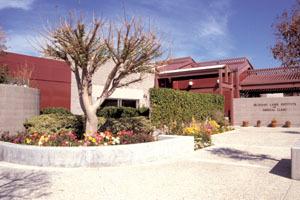 The Beckman Laser Institute & Medical Clinic was established in 1986 by Michael W. Berns and Arnold O. Beckman, who provided the necessary funding. The Beckman Laser Institute is an interdisciplinary center for the development and application of optical technologies in biology and medicine. It’s one of five national Beckman institutes supported by the Arnold & Mabel Beckman Foundation. At the building’s grand opening, Arnold Beckman “cut” the ribbon with a handheld laser.